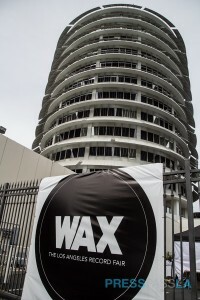 This weekend, the first Wax Record Fair was held in the Capitol Records parking lot. While not as grandiose as the legendary Capitol Records Swap Meets of the ‘70s, it was a great first-time event. The two -day fair, which they hope to make an annual affair, was a love letter to all things vinyl. There were vendors, a DJ, and panels on audio and art direction on Saturday, and, perhaps coolest of all, the opportunity to tour Capital Studios and experience the entire vinyl mastering process. Capitol Studios had a booth selling branded merchandise, and next to that, Blue Note Records president Don Was was manning the Blue Note Records booth. Across the aisle, Delicious Vinyl president Rick Ross manned their table. Fender Music Foundation, a 501(c)3 national music charity that provides instruments to music education students across the county, were on hand, auctioning off all kinds of cool signed items, showcasing big ticket items like signed guitars and a Germs poster signed by Pat Smear and Dave Grohl. There was some cool, retro turntables selling for much less than you would find in the stores, and Amoeba, Rockaway and The Record Parlour had booths selling vinyl and other collectibles. Dorado Music Packaging had a table showcasing the cool work they do. Wax was a great, low key event for audiophiles and music lovers of all kinds, and I for one look forward to attending their next event.